This extraordinary 2080 acre national park is five minutes from Oceanside Meadows Inn, in the heart of Down East Maine. A place where peace and quiet are combined with the magnificence of the Maine coast. Please enjoy some of the following scenes of Schoodic. Schoodic offers miles and miles of hiking trails and a spectacular one way 7.2 mile shore drive, perfect for bikers, that offers views of Winter Harbor Light across Frenchman’s Bay to Mount Desert Island and Mount Cadillac. The hustle and bustle of Bar Harbor and the Mount Desert crowds seems a million miles away, but in are fact just a stones throw across the water. Famed for it’s tranquility “Schoodic is a fine place just to sit and think, to be very quiet and see what happens around you…… “It’s not overrun. It’s not commercialized. 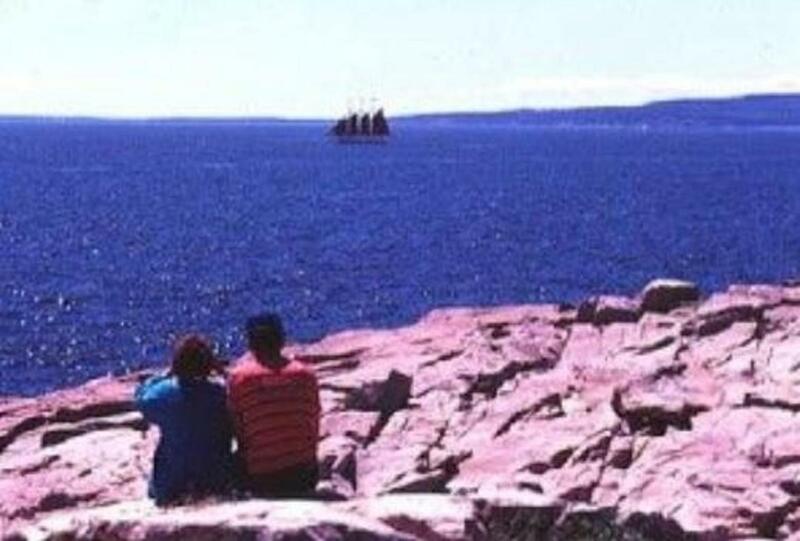 It’s not developed.” notes Bill Widener the Acadia National Park resident ranger. All the peace and quiet has many rewards not only to be enjoyed by the visiting human. Sensible seals searching for a perfect private sun bathing spot favor these shores during their summer vacations in Maine. Deer and Moose too enjoy the miles of trails, so convenient for getting around on the densely forested peninsula. With all the peace and unspoiled nature comes those that look for a real escape, many bald eagles and ospreys nest in this part of the park, and can often be seen gliding overhead and feeding along the pink granite rock lined shore. It’s a spot favored by the seagulls too that are often seen hovering over head at the point or following in the wake of the passing lobster boats. Human visitors are welcomed at the point by an official reception committee that consists of at least fifty gulls whose fee for their time consists of as much of your picnic lunch that your willing to give up, to these feathered friends. Coming prepared to meet this the only entrance fee at Schoodic is well advised since the show they offer, “Playing in Wind Currents and Jonathan Livingstone Seagull Impressions” are worth the small payment in itself. Your support also goes to keeping alive one of the longest running performances in Maine that opened to public in 1897 when John Moore first allowed visitors in to these his then private lands. Acadia’s Schoodic can be enjoyed thanks to the work of George Buckman a Boston aristocrat and Harvard president Charles W. Elliotwhose efforts during this period secured this property from the Moore family together with many acres in the region, placing them into a public land trust that later evolved into the National Park. Schoodic finally became part of Acadia National Park by an act of congress in 1929. Amenities for the visitor have been added, and are most prominent as you enter the park where a barbecue and picnic area has been placed at Fraser’s Point. A perfect place to prepare fresh steamers, lobster and other fruits fresh from the ocean. Settling into your feast you’ll be treated to magnificent views across Frenchman’s Bay to Mount Desert and Cadillac mountain while still enjoying all the peace the peninsula offers. Following the road toward the point and looking westward through the spruce lined shore you will capture glimpses of Winter Harbor Light that guards the entrance to this year round relatively ice free deep harbor, a feature from which it earned its name and popularity. The winding road that clings to the rocky shore passes over a couple of small coves offering wonderful opportunities to spot Herons feeding in the tall marsh grasses and see the many ducks feeding in and around the rocks. The experience of abounding unspoiled nature found in Acadia National Park at Schoodic is magical and all engulfing. On stormy days winds that drive up across Frenchman’s Bay down Winter Harbor often bring waves crashing along the rocky shore and across the road. The power of the ocean can truly be awesome, and is seen at its boldest as you approach Schoodic Point where surf crashing fifty feet up into the air is not an uncommon sight. Rounded granite rocks the size of grapefruits are often thrown up across the road and can been seen lying all along the scenic shore drive. One of the best ways to experience the tranquility and nature to be found in this the finest jewel of the Acadia National Park system is to take to the trails that offer some of the most exhilarating scenic vistas to be found on the coast of Maine. The Anvil Trail is found just beyond the Blueberry Hill parking lot which is about one mile further around the one way loop beyond Schoodic Point. This trail leads about a steep slope from which the trail earns its name to a 180 foot promontory that offers stunning views out over Little Moose Island. Following the trail will ultimately take you up to 440 feet and Schoodic Head offering panoramic views across Frenchman’s Bay, its many islands and rocky ledges. On a clear day one can see Winter Harbor and Egg Rock Lights to the west and Petit Manan Light and the Bay of Fundy to the east; three light houses from one spot a treat for anyone! One canloop back to Blueberry Hill by taking the Schoodic Head trail through stands of northern white cedar, red and white spruce, paper birch and jack-pine that dominate the rocky terrain. Vivid green patchworks of the myriad of moss species decorate the boulders of pink granite that are scattered about the forest floor. Lichen patterns of silver and purple adorn rocks along the banks of the stream that takes a steep decent parallel to the trail back down from Schoodic Head. Enchanting multiple small pools and miniature waterfalls whisper and gurgle above the sound of waves crashing on the pink granite rocks of the point, a sound that draws you along the crystal clear mountain stream through the forest and back toward the ocean. The Schoodic Head trail brings you down onto a dirt road where by turning left and following it toward the park rangers cabin you will find the Alder Trail (on your right) that takes you in a south easterly direction through dense vegetation favored by Woodcocks, Spruce grouse, Chickadees and many small song birds back to the park loop road. Turning left on the road will bring you back after a few yards to Blueberry Hill. The peace of tranquility of Acadia National Park at Schoodic can be discovered only five minutes from the door of the historic Oceanside Meadows Inn which sits on a 200 acre preserve at the head of sand cove, a perfect place to stay while enjoying Schoodic Peninsula and all it has to offer.